Don't make your teacher use their teacher voice...and use this mug to warn everyone else of it! The modern design has a classic teacher's apple on the front and back, and is fully personalised in house. 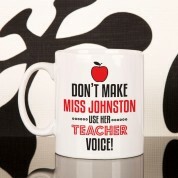 It says "don't make (teacher's name) use his/her teacher voice!" in a fun typographic design. 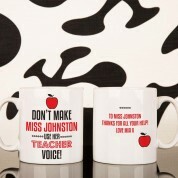 The back of the mug has space for a personal message to your favourite teacher! It's a perfect gift for Christmas time or at the end of term to say a big thank you for all the hard work they've done.